A new 25m Aquaculture Support Vessel is making waves on the West Coast of Scotland having been delivered in May 2017 to owners Inverlussa Marine Services. Built by Havyard Shipyard in Norway to plans by Macduff Ship Design, the vessel is designed with a specific purpose in mind – to support the fish farm sector – and can perform multi-role tasks such as mooring work and towing. The ‘Gina Mary’, as she is named, boasts two cranes of 48t/m at 18.5m outreach and 100t/m at 22m outreach respectively. With a beam of 9.70m and depth of 3.50m, the vessel is capable of carrying four 20ft containers on deck or a total of 115t of deck cargo. 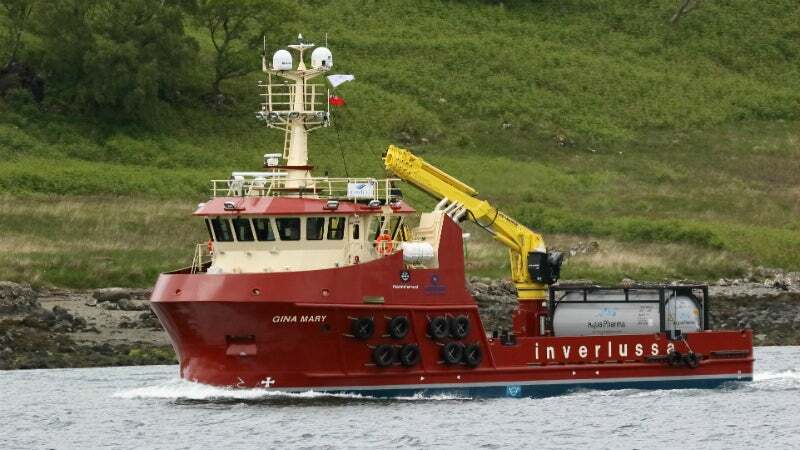 Built in just five months, the ‘Gina Mary’ is the third vessel that Macduff have designed for Inverlussa, with a fourth vessel – already named ‘Keira Fiona’ – due to be delivered in September of this year. The Keira Fiona is a near sister ship to the Gina Mary but at 25.5m adds a bit of extra deck space for salmon treatment operations. The second vessel is already well under way in build. Both vessels feature a spacious accommodation area, with cabins for six crew below decks on the Gina Mary as well as an open-plan galley / lounge area, dry locker, workshop, store and WC on the main deck. As one of the vessel’s main duties is to carry peroxide tanks for salmon de-licing treatment, she is also designed to meet the MCA hazardous cargo regulations. Moving below to the engine room, twin 600HP at 1,800rpm Caterpillar C18 main engines are installed, driving fixed pitch propellers in nozzles through ZF W650 gearboxes. Auxilliary power is provided a Caterpillar C12 engine and two Beta Marine generator sets. ‘Gina Mary’ is able to operate up to 150 miles from a safe haven and is already in service on the West Coast of Scotland. Her sister, the Keira Fiona has been designed to comply with Norwegian regulations as well, so has the option of operating in Norway as well as Scotland. Macduff Ship Design is delighted to have been able to work with both Inverlussa Marine Services and Havyard Ship Technology on these projects. Macduff Ship Design has had a busy year so far, with a series of new vessels being commissioned and built. Amongst these are a 90′ fishing vessel for Canada as well as a 12.75m pilot boat and a 16m tug being built in Macduff for UK owners. The company looks forward to the second half of 2017 and working on more exciting new contracts.